What do children love more than this classic tale of magic and the fear of growing up? 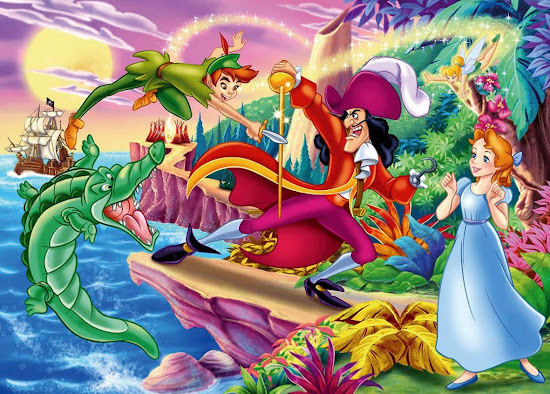 Every adult wants to be a kid forever and when I see Peter Pan, I feel like a kid again! Everyone knows the tale of ‘Peter Pan’. However, I have always wanted to see the magic of Peter Pan in a LIVE musical show. Well, the magical moment is here for ALL! Sunway Lagoon is playing host to Peter Pan and Tinkerbell and Wendy, as well as Captain Hook and Mr. Smee, and the whole production is being dubbed as ‘Malaysia’s first prestigious London West End Theatre musical production’! Peter and friends will surely knock-your-socks-off with a magical and adventurous musical stage show. Are you ready? 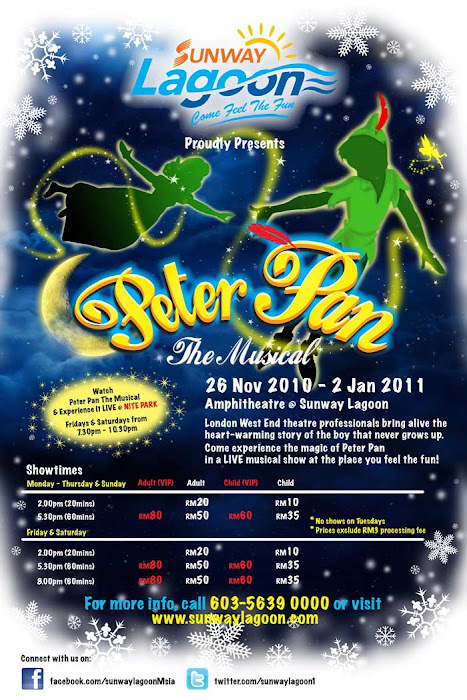 It is the ultimate fantasy adventure for young, old alike, and one not to be missed from 26 November until 2 January 2011, so book your tickets now! GET ME IN! 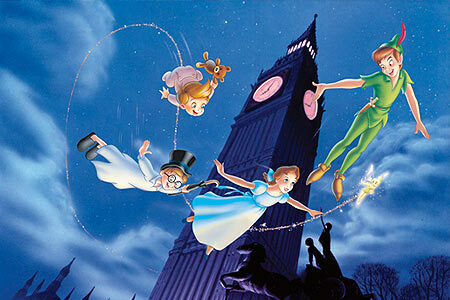 I want to join them on a thrilling musical journey to Neverland for an unforgettable treat! p/s: Check out the Grand Premiere of Peter Pan the Musical HERE! thanks for the info dearie! :D :D :D macam best jer ni..
ahhh i want to go! i want to go! i love musicals! This is definitely very much a kid-friendly musical. I remember the movie that was released some years back that had Robin Williams and Dustin Hoffman in it based on Peter Pan. I'm sure those who see it are in for a great ride! Peter Pan is so adorable! I enjoy watching the Disney cartoon movie. Hmmm, I am not fond of Peter Pan!! Not my hero! LOL! But I wonder how the songs and music will be like! I always like Musicals!! I love Peter Pan! I still remembered how the old days where people are trying to instill that all rich guys are bad and all poor men are saint. It doesn't work that way dear. Haha. But then, still love the story when I was a kid! huhuhu u missed it again!! hehe.. there is no Peter Pan Musical event over there?? u use to think Tinkerbell was real?? hahah...so cute! fans of Peter Pan would be delighted to watch this wonderful musical show. enjoy watching the colourful characters too.